Summer is in full swing! 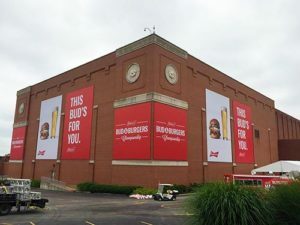 Anheuser-Busch freshens up their summer marketing strategy with these larger-than-life banners at their downtown St. Louis location. Piros Signs tackles 2 supersized assignments in 1 day. Piros signs had a busy day today. Despite the weather, our current projects today include the IKEA 3 sided pole sign installation along with completing an upgrade on the message boards for Ballpark Village and the Cardinals. [Read more…] about Piros Signs tackles 2 supersized assignments in 1 day. 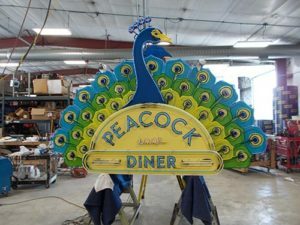 After an intense neck and neck battle, the Peacock diner sign took the top spot in the Readers Choice Award. We are very proud of our team here for coming together and working so hard on such a intricate sign. 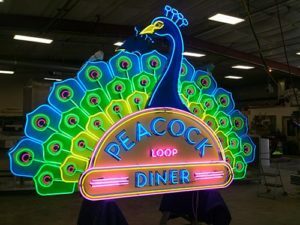 Piros made Peacock Diner’s sign has made it into the final round of Competition for the Signs of the Times Reader’s Choice Award. Piros currently in 2nd place for an International Award! Piros Signs has been nominated for the 3rd Annual Signs of the Times Readers’ Choice Awards! Ten Electric have been nominated thanks to their high scores on the judges’ scoresheets in the 2015 International Sign Contest voting. [Read more…] about Piros currently in 2nd place for an International Award! © 2019 Piros Signs, Inc. All Rights Reserved. Website by Off-Center Design. View our Sitemap.